In my 7 Dividend Investing Rules, my first four rules pertain to my stock selection strategy. As you can probably imagine, selecting what you invest in plays a big part of your portfolio building strategy. My focus is on the portfolio and not just the individual stocks I purchase. In fact, I am never solely focusing on the price I buy a stock at as over time, a great stock will grow and I get paid in the meantime to hold the stock. When you start investing, the overall portfolio structure is not your first thought. You are looking for a good blue chip stock to invest in and you usually start with a small amount. It was the case for me when I started so I understand where you are coming from. With a full portfolio now, I also understand the need to manage the investments in the portfolio through sector diversification and dollar cost averaging. What is consistent between the different portfolio size is how I chose stocks for my dividend income portfolio. It took me a few years to set up my process and I hope it can help others. The crux of it is that you need data which is why I have a master list also known as the Canadian Dividend Performance List. You don’t want to follow the news to buy a stock. The news looks for a sensational story and it creates a herd mentality. It triggers emotions and it’s important to make investment decisions based on data and not emotions. Let me first say that you never know what you don’t know. If you don’t have a stock list, you are navigating without a map. If you have a stock list, but it only lists companies you like, you may be missing gems. I made all of those mistakes in the past and because I could not find a list I could actually use with all the data I wanted, I built my own. I will admit that I do not have small cap stocks on the list for now even if they pay a dividend and have a good history of paying dividends. It usually means the companies do not have an economic moat. HAVE A MASTER STOCK LIST! There are many ways to start. I provide a list over at Dividend Snapshot with over 100 stocks, a ranking, and 10 years of data. You can use the Dividend Aristocrats list although the Canadian list is weak. You can use the stock screener over at TMX Money. There are some lists outlined at DRIPInvesting as well. If you are starting, many sectors may be of interest otherwise, you may have a sector in particular. 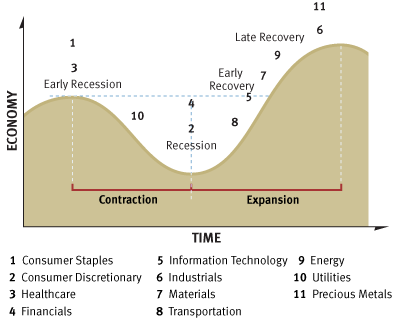 I am particularly found of having a sector strategy to help mitigate risks during market swings.Below is a chart showing how each sector usually does during a recession. I am not particularly interested in moving between sectors to take advantage of the cycle as I would need to know when it starts and when it ends. I do not have the skills not the inclination to time the recession markets. However, there is one sector that is most vulnerable and it is why I do not have a large exposure to the Consumer Discretionary. I have a sector allocation strategy and when I have money to invest, I look at which sector needs some money added to it. It allows me to narrow down on that sector. I will obviously take into account a great deal in another sector, but as you can see with the recession map above, there is movement and it can help add to current holdings at a lower price. It’s like an automated and unbiased buy low process and it keeps the emotions out of play. In this step, I combine the list of stocks I use with the sector my portfolio needs to target. This process eliminates a lot of stocks that you don’t need for your portfolio at this point in time.With the short list, you can easily eliminate stocks that do not match your investing fundamentals. For me, those three criteria are important. Invest only in companies where I understand the core business principal. Invest in companies that provide necessities. Invest in companies that have an economic moat. Once I have reduced the list to the companies with my core investing principles, it’s time to look at the dividend. Any companies matching the 10/10 rule moves up the list. Any companies with a higher yield than normal (i.e. price is down) move up the list. The higher the yield the better but it’s not a requirement – think CNR for example. I usually end up with 2 or 3 companies to choose from at this point. No emotion was involved. It’s pure analysis and filtering. If I have the choice to add to a holding, I might do so depending on how many stocks I have. I like to have more than 1 stock per sector too. It’s a very simple process once you are set up. You need a master stock list and a way to easily see where your portfolio is at – make use of a spreadsheet.